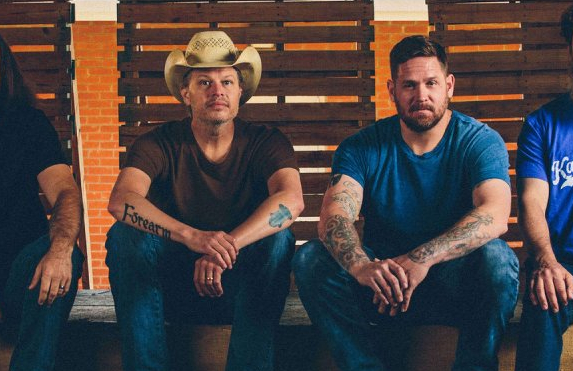 Founding member of Jason Boland and the Stragglers, and long-time Texas/Red Dirt community member Brad Rice has left the band to pursue other interests. Brad Rice had been Jason Boland’s drummer for over 20 years. The two met while attending Oklahoma State University in Stillwater Oklahoma in the late 90’s where both were members of the Lambda Chi Alpha fraternity. They would go on to form The Stragglers with bassist Grant Tracy in 1998, and the three had comprised the nucleus of the band ever since. Brad Rice released a statement on October 22nd, announcing his departure from the band. On Friday [10-19], I decided to leave The Stragglers, effective immediately. It’s not my place to make any comments concerning the future of the band, so I won’t. I will say I love all those dudes with my whole heart, and I will always be grateful for my time with them. There was nothing finitely wrong, and not one person is angry for making this decision to move on with my family, my new metal art business, and my commitment to make this world a more beautiful place. I have nothing but love and passion in my heart, and I’ve been contemplating making a change for several months, and the time has now come. I agree that it’s sad to see this chapter of my life close, but I’m also filled with hope and a yearning to create something outside of music. I will never stop playing drums, I just need to see through some of these other dreams that I have, one of which is to be a normal old husband and father who’s always there. I’m sure you guys can understand where I’m coming from, and I appreciate your support. Along with being Jason Boland’s drummer, Brad Rice was also very active in the Red Dirt music community, often broaching important issues on social media, and being one of the important voices in the movement Jason Boland and Brad Rice helped form along with other acts such as Stoney LaRue and Cross Canadian Ragweed. Brad Rice was considered Jason Boland’s right hand man, and is well-known and admired among Red Dirt fans. Originally from Edmond, Oklahoma just north of Oklahoma City, Brad Rice now lives in Jenks, Oklahoma near Tulsa where his Iron E Custom Art business is based. After Jason Boland relocated to Austin, TX, Rice would often fly down to join the band for tours. Incidentally, the Jason Boland and the Stragglers show on October 19th at the Whiskey River Saloon in San Angelo was canceled—the same day Brad Rice made his decision. However subsequent shows have gone off as planned, and no future shows will be affected. Saving Country Music reached out to the publicist for Jason Boland and the Stragglers to see if there was any statement by Jason Boland or anyone else about the departure, but none was provided. There is also no name of a permanent replacement drummer at the moment. If I’m not mistaken, he announced his departure 6 or 7 years ago, then had second thoughts and never followed through with leaving. Good dude though. Wow. I guess instead of saying, “I miss Roger Ray,” from now on I’ll say, “I miss Roger and Brad.” Best of luck to all parties. Not going to be missed. Roger Ray was a much bigger loss. Brad and his ego needed to move on. Roger, as well as Noah. He was a beast too. What a tool you are….Brad is a hell of a nice guy, on and off the stage. A guy has principles and you call it an ego. You must be a small minded douche. I’m gonna call bullbutter on that one – only from personal experience. He’s ALWAYS been nice to me, long before anyone “had” to be nice to me – and not a whole lot of people were: Or are. My goodness, what an awfully mean-spirited thing to say. 🙁 It’s too bad you don’t adhere to the adage that if you can’t say anything nice, then don’t say anything. I, on the other hand, would like to wish Brad all the best in the future. He’s an amazingly talented person. I saw them in Kentucky. As soon as the show ended, Brad walked right off the stage, right up to me and handed me his drum sticks. Pretty cool. Not going to be missed….what a tool for saying that. Small minded douchebag thinking there, mistaking principles for ego. Brad is a hell of a good guy, on and off the stage. Sounds either like jealousy or hate on someone successful. Brad Rice is a class act and a helluva drummer! I was at the 2007 Bossier City show referenced in “Something You Don’t See Everyday” from the Comal album. This drunk douche just runs and leaps on Brad’s kit while they are mid song. The merch dude snatched him from the stage and the Bossier cops were not entirely gentle with him when they arrested him. To my amazement and being the total professionals they are, Jason, Brad and the band finished the show. Unbelievable considering Brad had a broken foot. Brad will definitely be missed for his musical chops and his style of playing. I wish him nothing but the best of luck in his future endeavors. Brad and I have had our differences. But at the end of the day, we talked it through and understood each other’s point of view. He is never egotistical with me. A man of principle? Yes. But never egotistical. He and I still are friends. We still text each other. He is a great guy. I have seen him stay talking to fans for an hour after a concert. No ego. Just a helluva nice guy trying to be happy and make the world a better place. That website was one of the only official sources for country album sale numbers… They did great articles and reviews too. Here is a source. Matt Bjorke commented on it in the comment section but he hasn’t tweeted about it yet. Roughstock has been around for at least over 15 years or more. Is he taking that 4 foot bong with him or does that stay on the bus? I was a little late in discovering The Stragglers but as soon as I played some of their music and paid attention to the lyrics, I was hooked. They are now pretty much on constant rotation in my house, in my car, and at work. Selfishly, I’m bummed to see Brad leave and worry about the impact on the band and their music moving forward. The non selfish side of me gets that he has other passions to give his time to. He’s a talented artist and I wish him and his family well.